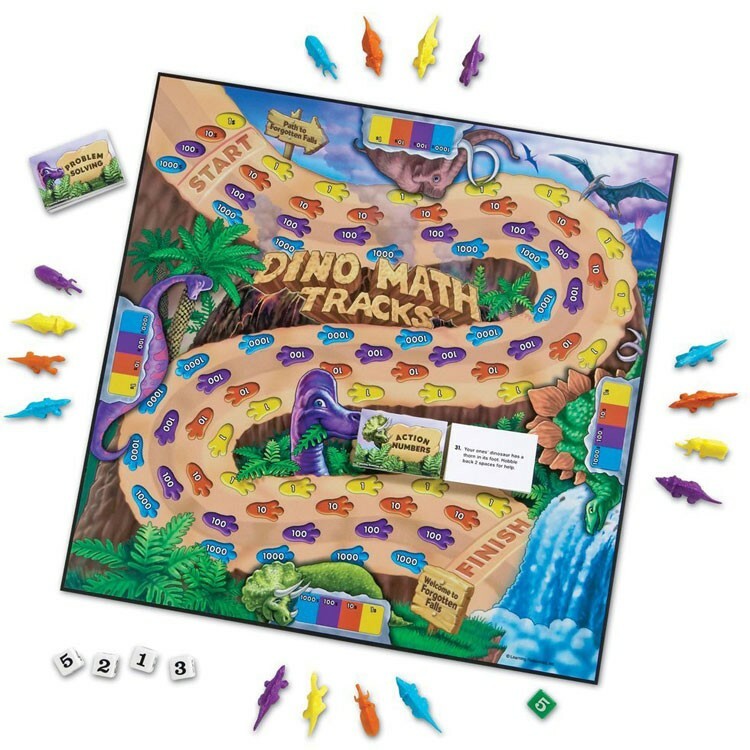 Make math your boys or girls favorite subject with the Dino Math Tracks teaching board game by Learning Resources. 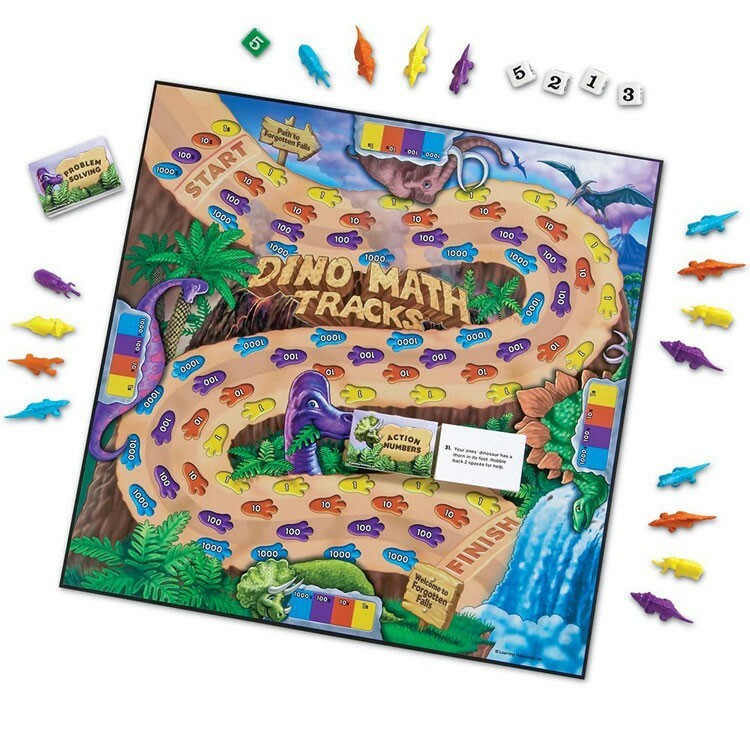 Dimensions of package 10" x 19.8" x 1.8"
Write your own review of Dino Math Tracks Learning Game. 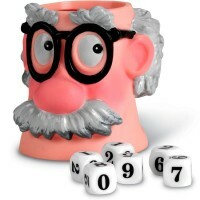 Rating: 5 My son likes it by By A customer My kids loves numbers, and actually asked for this for his birthday. Um, OK. He likes it! Rating: 1 QC failed product! by Jaimie Lousy QC, one game piece is missing and the other has duplicate, a very basic mistake that just shouldn’t happen. 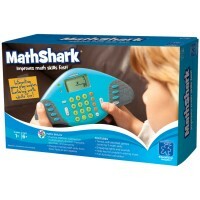 Rating: 2 Short game, too easy for 1st and 2nd graders by Jaimie The game is well made, but my kids are bored with it. They’re in 1st and second grade, and it’s just far too easy. The game is over in less than 10 minutes every time. What fun is that? For the price, we expected more. I’d return it but we already played it. And then played it again thinking we did something wrong. I’d spend your $ on something else. Rating: 4 The kids love it, and it's inoffensive and somewhat educational. 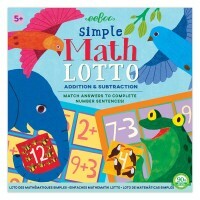 by By A customer I got this for the kids on the assumption that it would help to teach math.Honestly, it doesn't teach a great deal of math, and even that not in a very rigorous way. 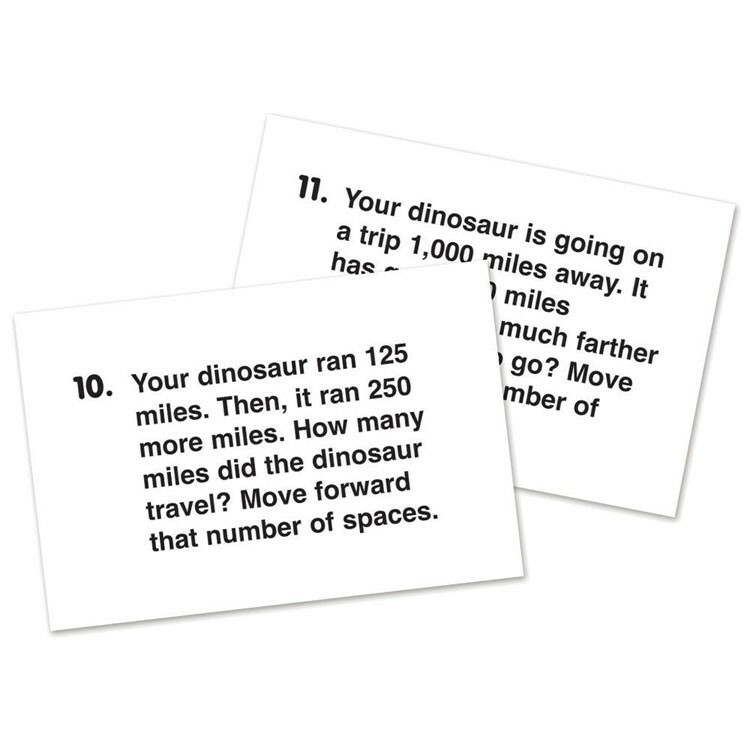 Just some very basic basics, like recognizing place value (what's the difference between 1, 10, 100, and 1,000 for example—and which are which?) and counting.And as an adult, I have to say that the game seems boring, repetitive, and unimaginative to me.BUT, with that said, this game is an absolute favorite with my five-year-old, who wants to play it all the time still, months later. And while my six-year-old isn't quite *as* enamored with it, she still says okay every time, enjoys herself, and gets into the game.So as with so many things in life, even if it seems dull to an adult, it can still be absolutely absorbing to a kid. 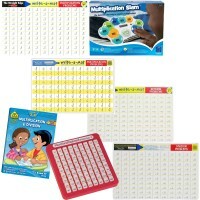 And even if it doesn't teach all that much math, it's still G-rated and has numbers and counting in it. When you compare to all the other "absolutely absorbing to a kid" stuff that's out there in the world today, those properties make it stand head and shoulders above much of the rest. Rating: 2 I received a used game by By A customer Haven't played the game yet, as it was just delivered. Review is based on the condition I received. This game is used. The box is dented, and torn on two corners..meaning it doesn't close properly. It was taped shut with large pieces of packaging tape wrapping almost entirely around, which can't be pulled off without destroying the box even more, and the price tag was peeled off with dirty residue like it has been sitting in someone's closet for a while. The game board also dirty, but luckily only on the back side...probably because the box doesn't hold the board in, and it fell out a few times before they got out their giant roll of packaging tape. The pieces are there, at least from what I've seen...haven't counted the cards yet. I want to return this so bad, but the kids have been waiting patiently, and since it appears the pieces are there I will keep it, and fix the box. I just won't be ordering from this vendor again. AS FAR AS THE GAME GOES--it looks very cute. The dinosaur pieces have my kids in squeals, and it seems like it will be both fun, and educational. Rating: 5 Fantastic Game! by By A customer Purchased for my 5-year-old. This is a fantastic game! It's got several levels (we're playing the easiest currently) with two different card sets that are used for the harder levels. The dinosaur toys are great for keeping a younger kid's interest. 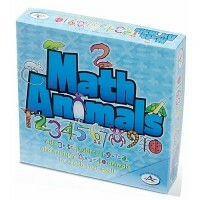 Strongly recommend as a math game that will actually keep a kid's interest. 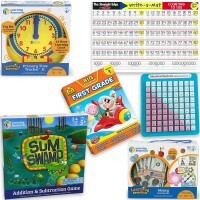 We own a lot of different math education games, and this is turning out to be one of our favorites. 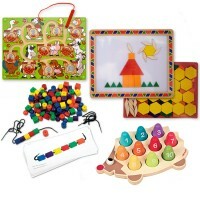 Rating: 5 Five Stars by By A customer Good game for all family member. When my kid gets older, we can play next level game. 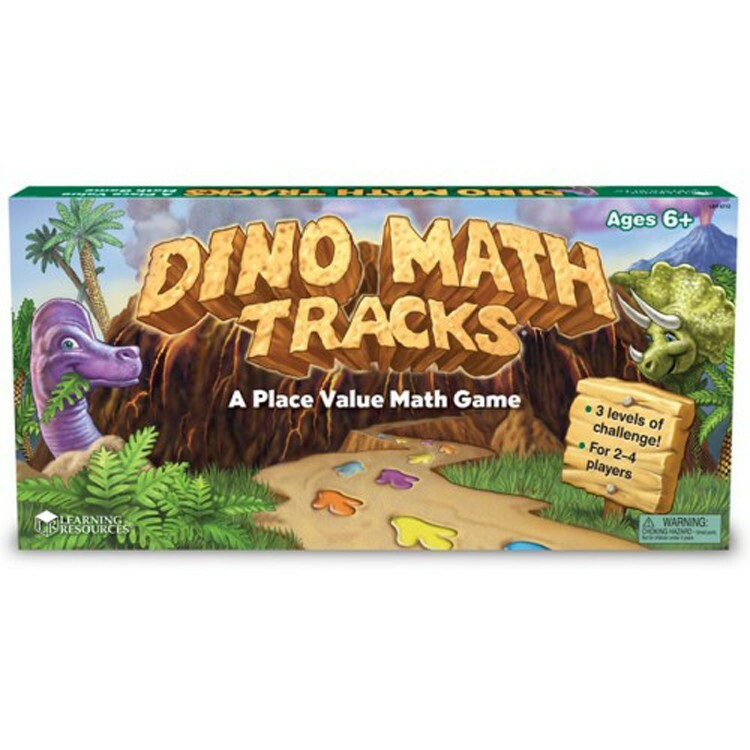 Rating: 4 and this game is amazing for teaching place value by By A customer I'm an elementary school teacher, and this game is amazing for teaching place value. Instructions are clear. 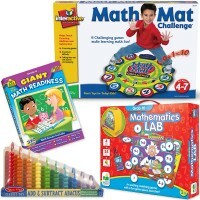 There are three games (one with just rolling, one with rolling and action cards, and one with problem solving) in the game, plus ways to add an extra challenge or make each game a little easier, depending on your needs. My only complaint is that the cards for the second and third games are very thin. 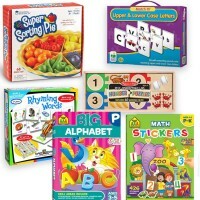 They're printed on paper (as opposed to card stock or cardboard), so they would need to be laminated for durability. Rating: 5 by Katrina, NJ Really great game. 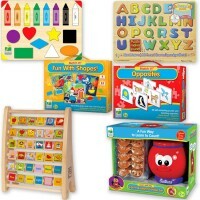 Educational and fun. Thank you. Rating: 5 by Kay, GA It's gift, so I'll know more later.